All our school groups are encouraged to carry out a whole school action in order to promote the project aims and themes among the wider school community. The Awareness Day activities are an exciting way of engaging other students in the project and ensuring that all the good work gets noticed. 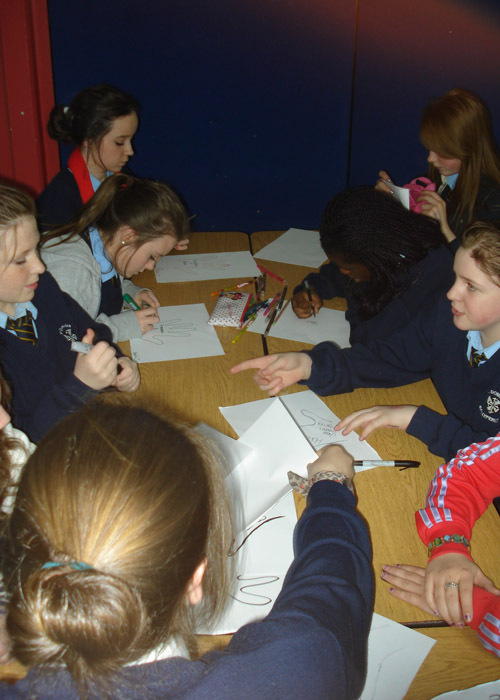 It is also important to share the creativeness and enthusiasm with other school groups. That’s what we call peer-learning! We had an Awareness Day on 17th May. 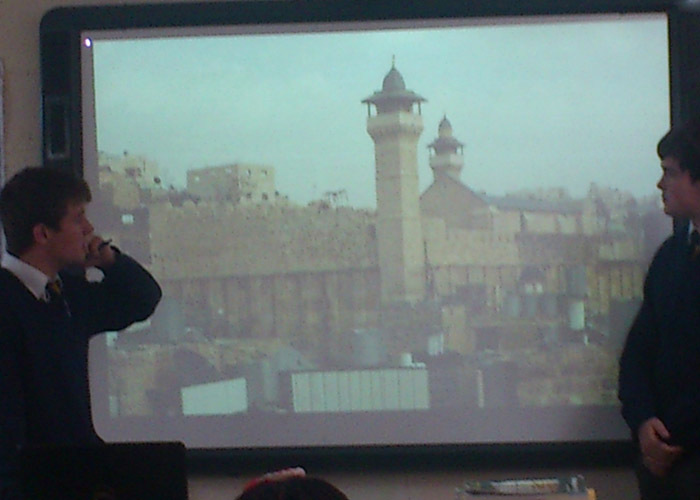 We brought all the 1st Years together and we explained about the conflict going on in Israel and Palestine. We showed them our folders and newspaper clippings from Israeli and Palestinian papers. They asked lots of questions and seemed very interested in what we were telling them. They drew their hands and picked a concept that meant most to them. We showed them pictures of Israeli and Palestinian students in Israel and Palestine with the posters we had made. We told them about the stduents we met and the messages they gave us. Our class and I discussed with my teacher the day we would set for the Awareness Day. We decided to hold it on Thursday 1st March 2012. The aim of the day was to raise awareness about the conlflict between Israel and Palestine. 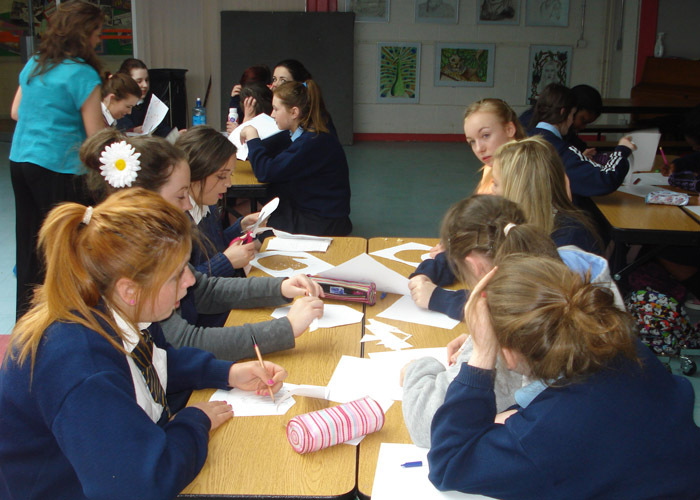 One group of students organised art materials. We hung up posters to advertise the event. We then distributed jobs amongst the class. 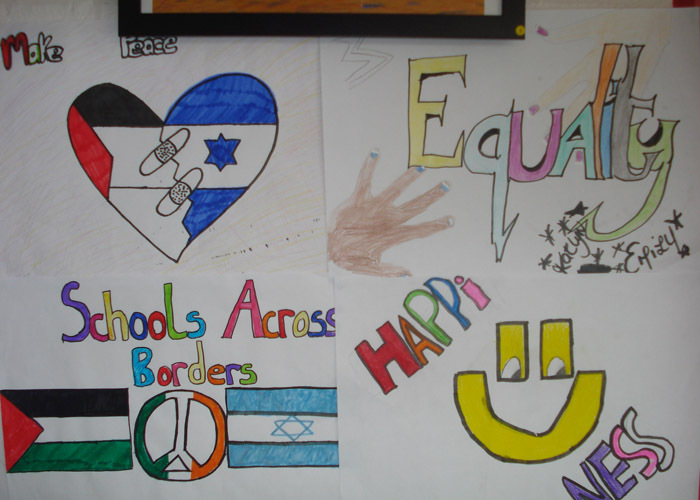 Another group of students did a specific task for the day ( e.g making Israeli and Palestinian flags). On the morning of the day, we made sure everything was ready and set up in the front hall. We set up four stands, one in each corner. We then posted up posters, the Israel, Palestinian and Irish flags. 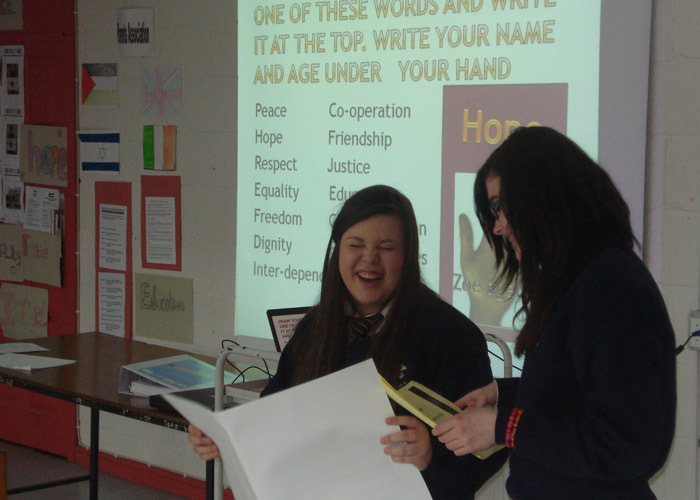 We also had posters of important themes such as Interdependence, Peace, Freedom, Hope, Love etc. We then had pens and paper put at each stand for the people at the stands. We finally started when all was ready. There were three slots of 20 minutes to man the stand. Here we had to invite students and staff to trace their hands. 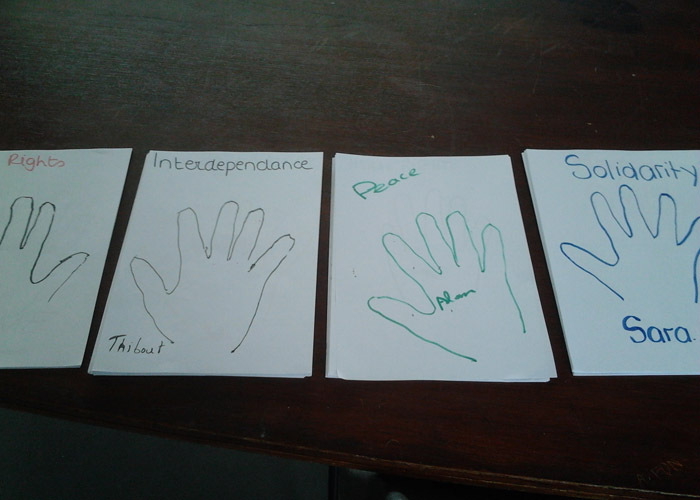 We traced people’s hands and asked them to sign their name, age and writing in the hand a theme that was meaningful for them. We would then stick up the pages around the school so that people could see them and think about it so they would become more aware. We then took pictures of these posters and of the day and sent them out to Israel and Palestine. The hand symbolised support. We were offering our hand of support. 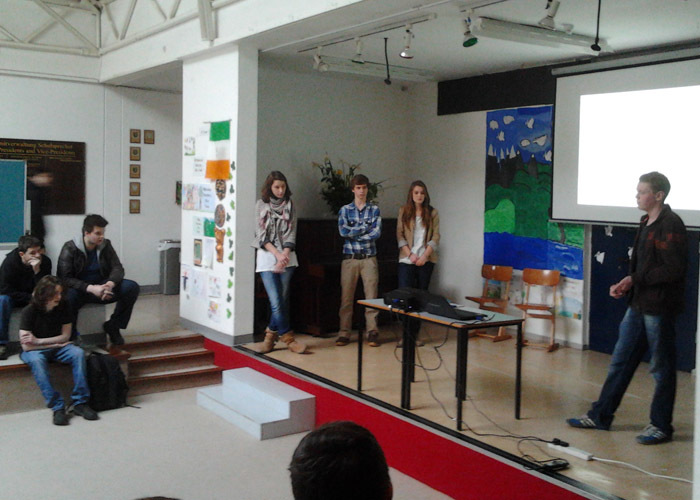 We also explained what the project was about and its aims. Overall, our class and teacher were pleased with the awareness. We had many pages. We thought it was a great success and were grateful for the positive comments we received. I feel we also got to spread the word about the conflict, which was the aim we set out to achieve. Now people are much more aware and understand the conflict more and want to do something about the conflict in Israel and Palestine. By sending out the photos we were able to show the two countries that we care, that we want to help and that we did this to support and help them. 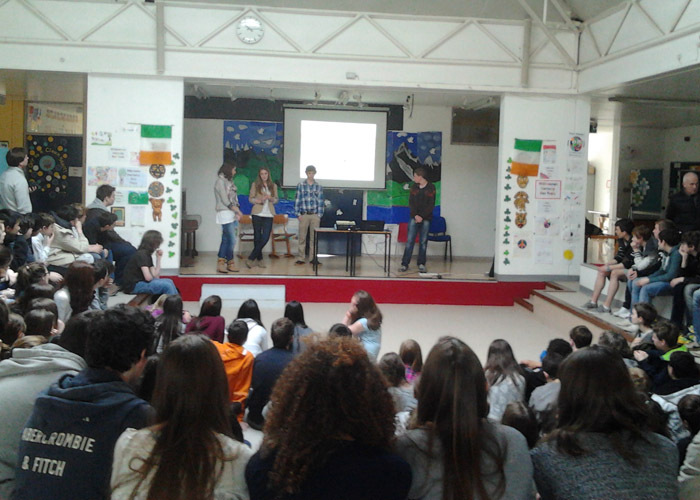 On the 22 March 2012, the students from the Lycée Français d’Irlande and from St Kilian’s organized an awareness day regarding the Schools Across Borders project. We prepared an exhibit made up of five information boards. Three boards were placed at the entrance of the building while two other boards were located in the corridor leading to the canteen. On these boards we displayed the themes which we’d studied during the project. We printed out fact sheets which we made ourselves. These sheets contained information about the various themes, the main ones being interdependence, human rights, the separation wall/security fence, the checkpoints, the settlements and the terrorist attacks. The SAB logo and title was also displayed on each information board. 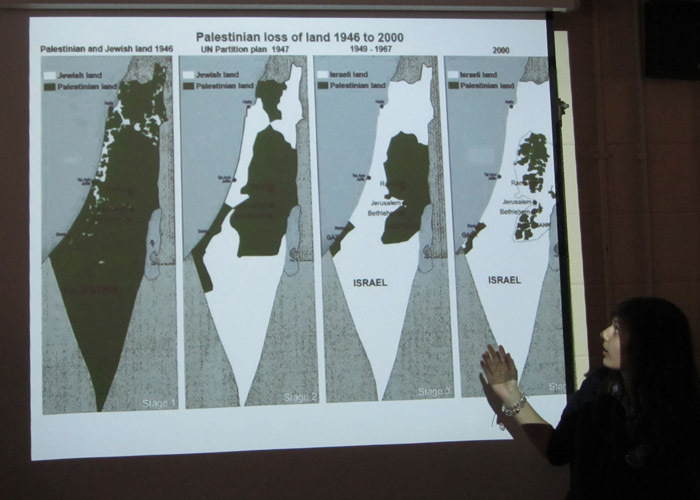 The fact sheets were illustrated with pictures and a map of Israel and Palestine had been drawn. For the students who came to see the boards of information to feel like they were contributing to our awareness day, we asked them to draw their hand on a sheet of paper. They then wrote their name and a value they had chosen beside their hand. By doing this, the students were able to show support to the Israeli and Palestinian students. 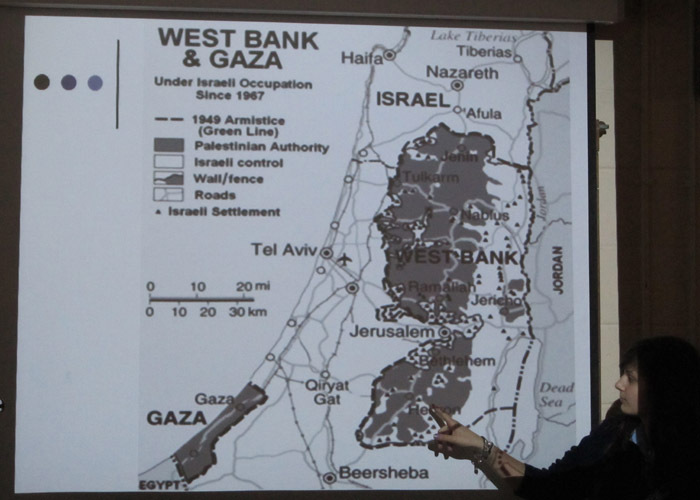 There was also a conference organized by some of the students who went to Israel and Palestine. François, Adrien, Stacey and Adèle set up the conference which was aimed at students in the LFI as well as in St Kilian’s who are in classes 8 and 9. The event took place on the 6 March between 10.10 and 10.30 am in the assembly area. The four students were accompanied by a Power Point presentation they had prepared themselves which included pictures resuming their trip briefly. Overall this conference was a good way of initiating future transition years to the SAB program and showed them that learning about a foreign conflict can be very interesting. Adèle, one of the three students who went to Israel and Palestine as part of the project, put together twenty pictures representing the things they had seen and the main ideas of their trip. These pictures were presented on the television screen in the assembly area. This raised awareness regarding the project as well as the conflict. 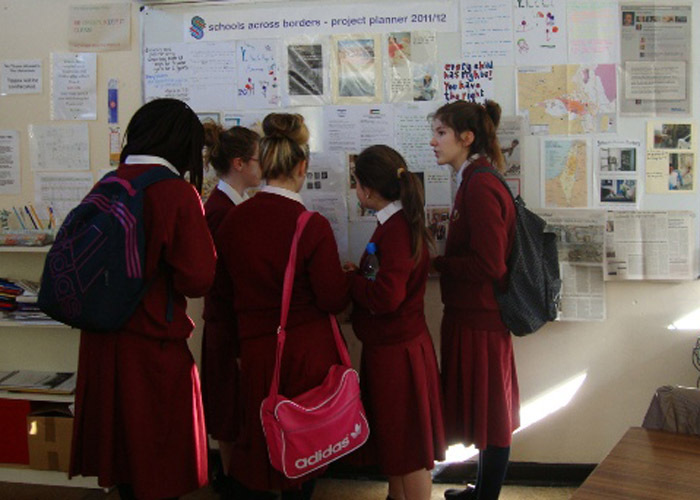 The ‘Awareness Day’ was a success as stations were set up in key spots enabling all students from around the school to see at least one of the boards of information during the day. We were also successful in getting a lot of hands showing support towards the Israeli and Palestinian students. 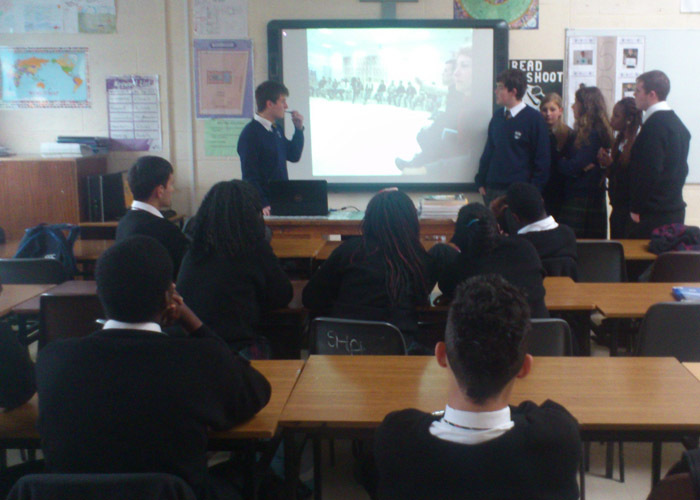 Students of both schools were happy to get an opportunity to understand a conflict that has a global echo. 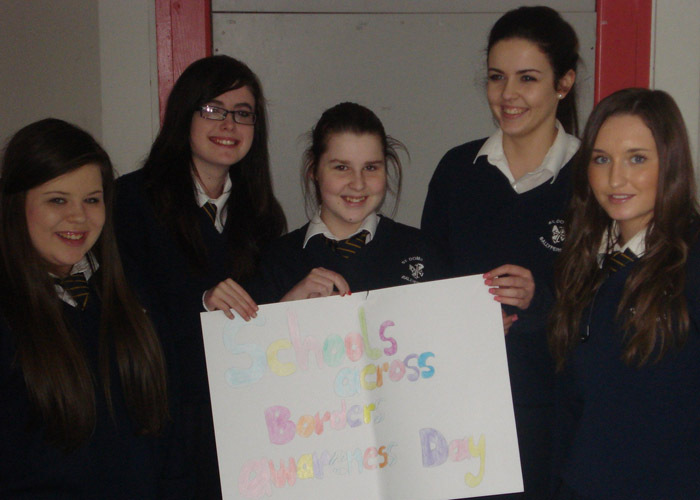 This year we had our Schools Across Borders Awareness Day on Friday the 20th of April. We spent a few weeks before the actual day getting everything ready for the day itself. We made posters with the important rights for children on them. We fixed up our presentation and met with the other class that does the project and decided on who would do the presentation. The day before the awareness day we put all of our posters up in a place that the students would see them which was the canteen. On the Friday we made an announcement on the intercom telling all the students about what the day was about and invited them to read the information on the posters. In the afternoon we called the 1st year students down to the canteen. 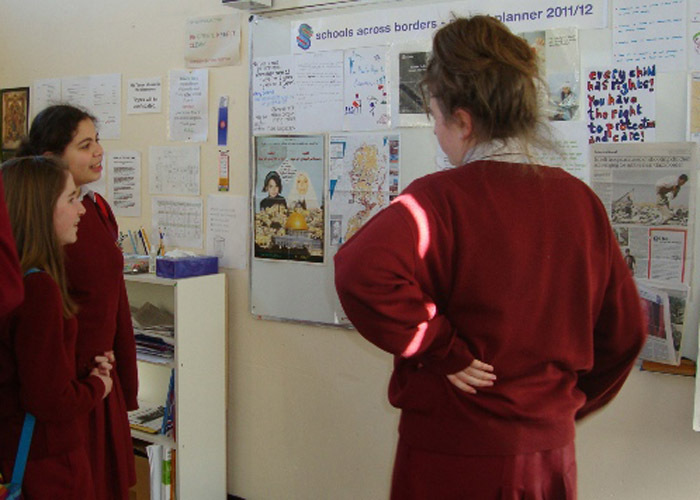 2 students from each class stood up and made a presentation about what Schools across Boarders is and what they do. We told them with the help of Mr O’Brien about the settlements, the wall, the army and the rights that we all should have. When we were finished we got all the students to draw their hand and write their favourite right on it and say why it was there. We had a watch for the best one. From doing our awareness day we learned how to present our work. We learned how to work with groups and we learned communication skills. We feel the day went well because we learned lots of new skills while telling people about the work we did in transition year and about Schools Across Boarders. 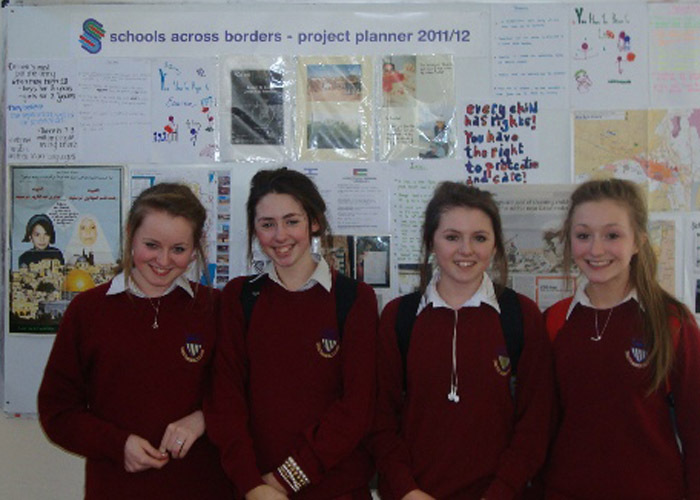 Our class 4L did a project called Schools Across Borders. We had an awareness week to show our school what we’ve learnt. We divided into groups, each group was allocated different jobs; there was poster-making, survey writing group and a PowerPoint group. 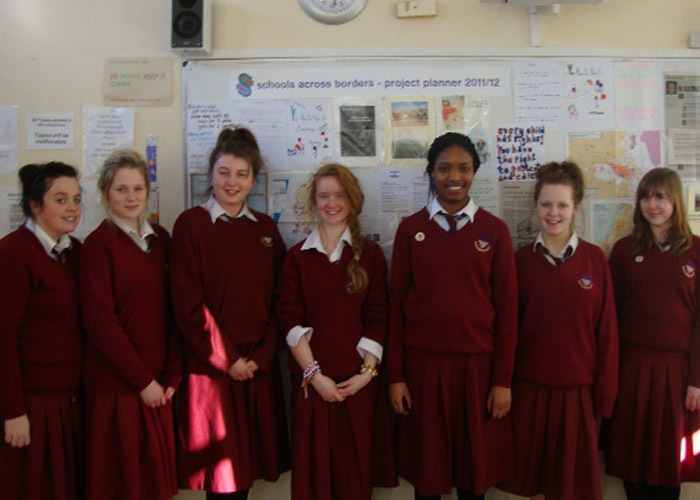 There were 5 of us in the PowerPoint group – Carolina Bancila, Diana Husca, Caoimhe Bermingham, Alaina Dunne and Natasha Gaboa. Within this group we divided into whose writing and reading which part of the PowerPoint. Going around and informing seniors about the conflict, was a new experience for us and an informing on for everyone else. It gave us more confidence and courage to stand up in front of other classes and inform them about an important issue, which could be said to be similar to the Northern Ireland and Republic of Ireland conflict. We enjoyed doing SAB which allowed us to learn about the conflict in Israel and Palestine and act like mediators between the two sides. We loved informing other people about the information we have learnt. Thank you to Darran for giving us this opportunity. 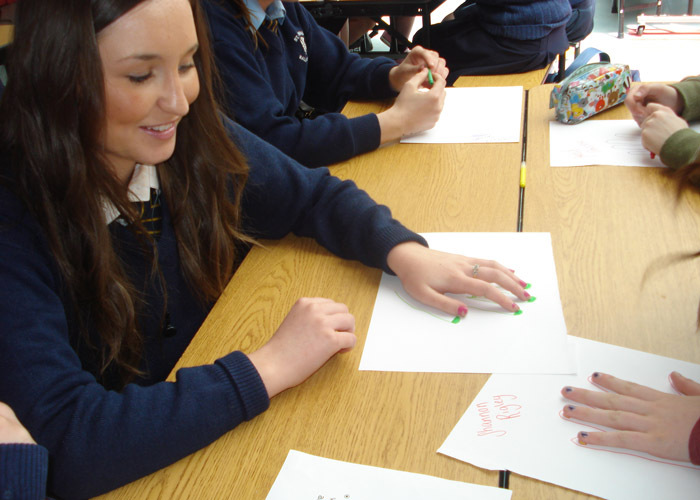 By Carolina Bancila, Diana Husca, Caoimhe Bermingham, Alaina Dunne and Natasha Gaboa. 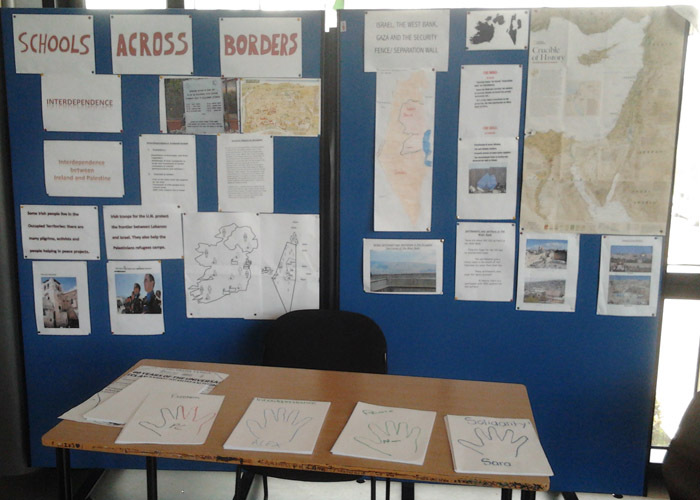 As part of our 5th Year religion course, we took part in the ‘Schools Across Borders Project’ which is an organisation that helps connect Israeli & Palestinian students with Irish and Northern Irish students. 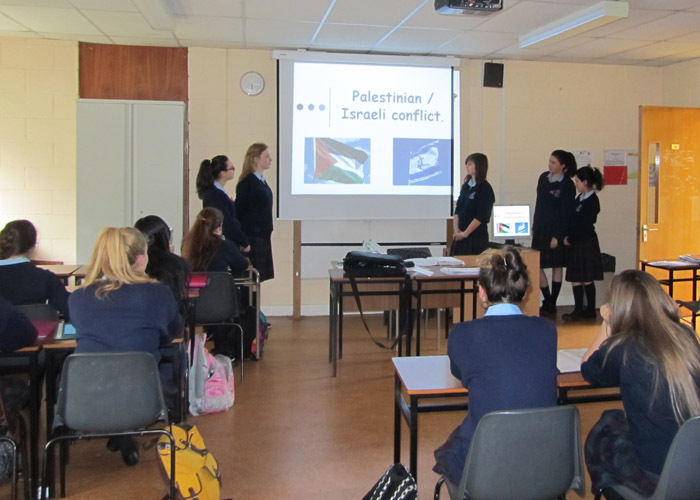 It helps the Irish students learn about the conflict going on in Israel and Palestine and their views on it all. There were many aims to learn about in the project and we chose Human Rights. We watched videos of the Israeli and Palestinian students and learnt about their daily lives and the human rights they have. They spoke about the conflict in their country and expressed their opinions on it all. 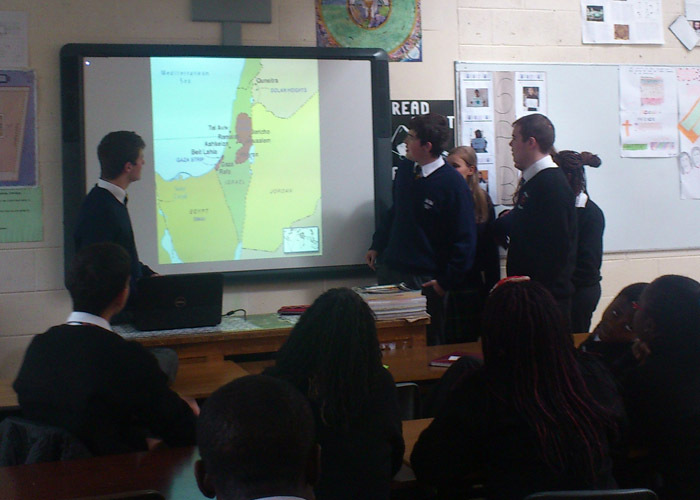 We met both the Palestinian and Israeli Students when they came over to Ireland. We listened to their stories and opinions on each other. 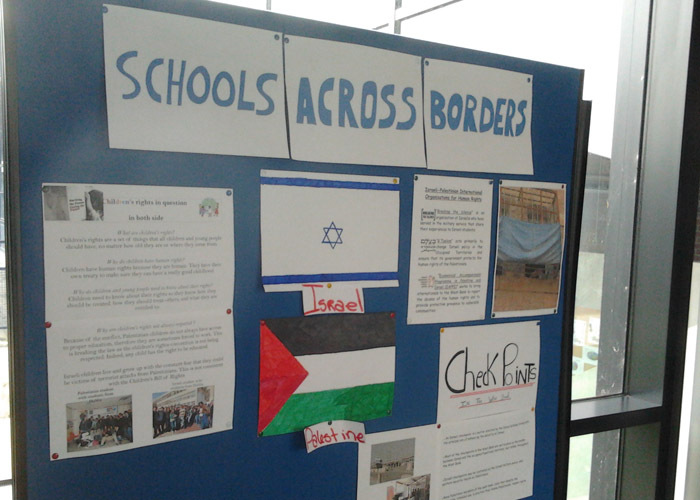 It was really beneficial to take part in the ‘Schools Across Borders Project’ as we learnt a lot about the conflict and division going on in Israel. It was also really interesting to meet and listen to the students who came over. All of us learnt a lot from them and will keep in contact with them know that we know about them and their lives. 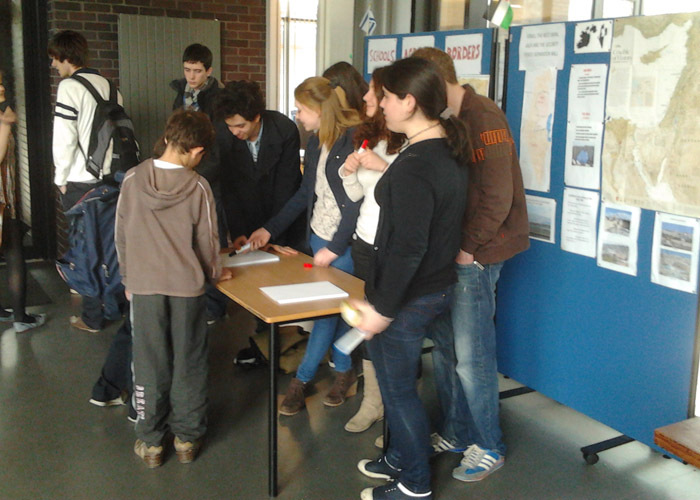 After the programme finished we wanted to inform other students in the school about it so we held an awareness day on February 29 at lunchtime. 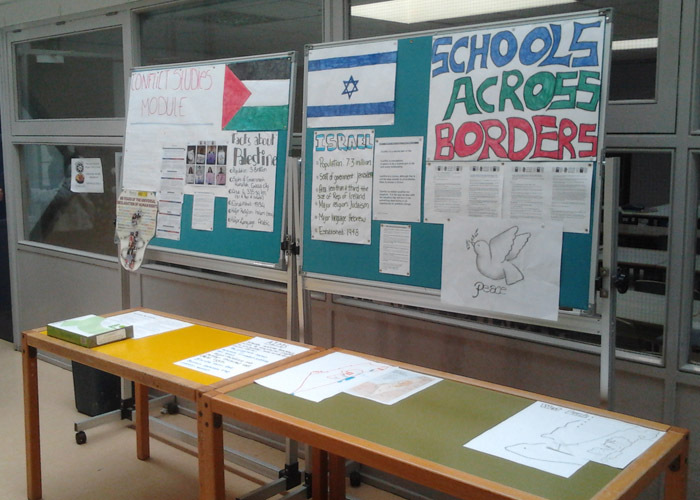 We put together a display of newspaper articles, photos and fact sheets about the conflict and answered any questions other students had. It helped to expand on what we had learned and was a great success.